With repeated drug-use, neural sensitization may occur whereby the drug elicits a potent response in striatal-dopamine neurons coupled with a strong degree of positive reinforcement. At the same time, long-term exposure to drugs significantly attenuates neural responses to intrinsically rewarding stimuli in the environment (e.g., a beautiful landscape, the smile of a baby, a delicious meal). In other words, through neuroadaptation the addicted individual learns to experience reward via self-administration of drugs rather than by enjoying the subtle beauty of the natural environment or the affiliative or health-promoting objects found therein. This re-wiring of reward learning entrenches the drug user in a cycle of drug-taking that serves to maintain the ongoing use of drugs. Indeed, vulnerability to relapse has been attributed to increased incentive salience of drug-cues and decreased salience of intrinsically rewarding stimuli (166, 167). Though pharmacotherapies may provide acute relief to drug addiction-related anhedonia, their effectiveness in facilitating restoration of normal, healthy reward learning remain unknown. Thus, therapies that target reward processes over the long-term, either in the absence of, in adjunct to, or after pharmacotherapies have been discontinued, are very much needed. 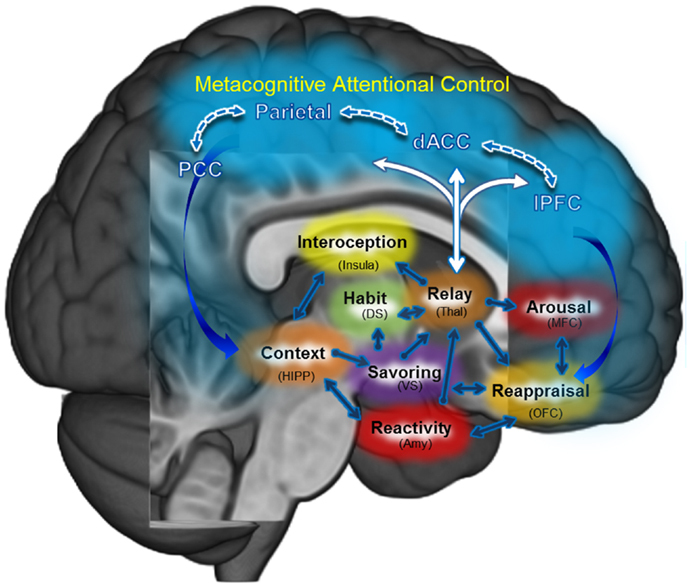 By teaching participants to mindfully attend to pleasurable objects, events, and experiences, MBIs may amplify hedonic processing of natural rewards and thereby counter the allostatic effects of addiction on reward neurocircuitry. This form of selective attention to positive experience, known as savoring, is one of the most robust positive emotion regulation strategies (168). During savoring, one not only attends to a broadened diversity and range of sensations and perceptions, but also to the positive emotions elicited by the sensory-perceptual experience. As such, attending to present-moment experience prospectively predicts positive emotion (169). Thus, learning to mindfully savor pleasant events may offset negative affective states that often trigger addictive responses, and restore the salience of naturally occurring and intrinsically rewarding objects and events (e.g., social affiliation, healthy diet and exercise behaviors, engagement with novel and stimulus-rich environments, etc.). Through mindful savoring, MBIs may provide a means of reward replenishment and ultimately reverse the reward deficiency syndrome inherent in addiction – a therapeutic process plausibly important for allaying craving and deterring relapse. Research suggests that mindfulness training can increase reward experience and positive emotion in both healthy and clinical populations (7). In studies of healthy individuals, mindfully savoring food items increased pleasure from eating (170), and mindfulness training amplified positive stimulus evaluations (171) and increased positive emotional information processing (172). In clinical populations with low positive and high negative affect, MBIs have been shown to be effective means of enhancing positive emotion. Studies demonstrate facilitative effects of mindfulness training on positive affect on patients with major depressive disorder (173), bipolar disorder (174), and HIV (175). Importantly, Geschwind et al. (173) found that Mindfulness-Based Cognitive Therapy increased reward experiences from pleasant daily events among persons in partial remission from major depressive disorder. Insofar as intentional up-regulation of positive emotion is believed to involve increased activation in a predominantly left lateralized prefrontal network that potentiates striatal activation (135, 176), mindfulness-induced positive affectivity may remediate impaired dopaminergic responses in the striatum to hedonic stimuli. Plausibly, MBIs, which also increase left lateralized PFC activity (177), may restore natural reward processes among drug addicted individuals seeking abstinence. The most direct support of this hypothesis stems from recent findings from a RCT of Mindfulness-Oriented Recovery Enhancement for prescription-opioid-misusing chronic pain patients. Participation in 8 weeks of this particular MBI (which specifically focuses on mindful savoring as a key therapeutic process) resulted in significantly enhanced reward responsiveness as indicated by cardiac autonomic responses to positive emotional stimuli presented during a dot probe task. Crucially, the opioid craving-reductive effects of the intervention were statistically mediated by enhancements in reward responsiveness (Garland et al., submitted for publication). The effects of mindfulness-centered regulation of reward processing might be measured with a positive emotion regulation neuroimaging paradigm, in which participants are instructed to up-regulate positive affective response to intrinsically rewarding stimuli. If mindfulness training fosters reward processing, individuals in recovery from addiction might exhibit enhanced dopaminergic striatal responses to naturally rewarding stimuli coupled with enhanced ratings of stimulus valence. Alternatively, the Effort Expenditure for Rewards Task [EEfRT, (178)] is a task probe of a subject’s willingness to expend effort to receive reward, and theoretically an indirect probe of dopamine-mediated reward processes. In brief, during this task, subjects are provided with a choice period in which they may choose to perform either an easy task for a smaller reward or a hard task for a larger reward. The probability of winning is manipulated and stated to the subject during the choice period. Following the choice period, subjects perform the task and receive feedback about their wins. MBI-related enhancement of reward responsiveness might be indexed by increasing hard task engagement and modifying reaction times on the task. The effects of MBIs on cognitive regulation of extinction learning might be measured by combining neuroimaging, self-reported craving, and self-reported emotion regulatory strategy during a drug cue-reactivity paradigm. Pre- and post-mindfulness training, addicts could participate in cue-exposure sessions (e.g., a smoker might be asked to handle cigarettes, ashtrays, and lighters without smoking for a limited period of time, followed by an ad libitum smoking session) in which skin conductance, heart rate, and craving responses could be measured throughout. If mindfulness enhances cognitive regulation of extinction learning, cue-elicited skin conductance, heart rate, and self-reported craving would be reduced following mindfulness training relative to an active control intervention, as would drug-use following the cue-exposure session. Are there Types Of Alcoholics?